Cloud and Open Source. They enable each other. How do you make money from Open Source Software? Charge for services. What is cloud? Automated, ubiquitous services… often based off of Open Source! 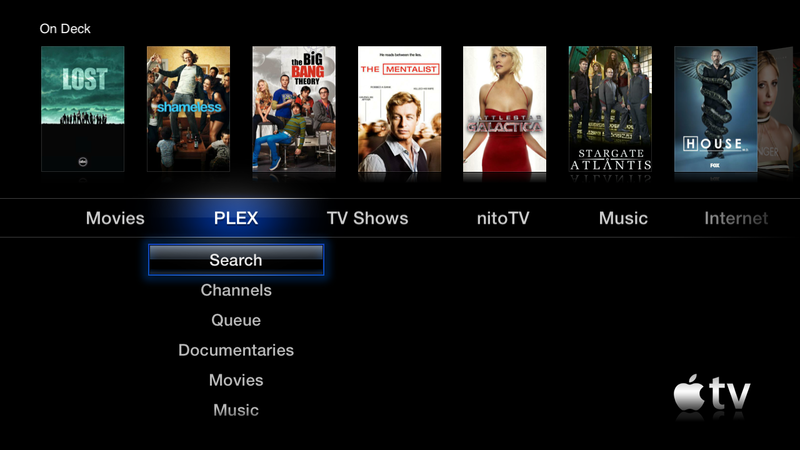 I use Plex as my Home Theatre PC system. It first started as a way to play videos through my 55″ Plasma at home. Its turned into a 5 year project and video collection. 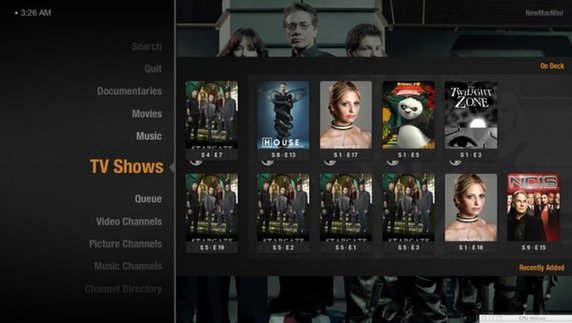 I talked to Elan, the creator of Plex and who now runs a company developing and monetizing it. He said that they were already ( or soon?) 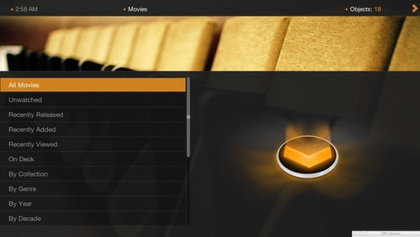 going to be revamping the default Plex desktop client. I told him that I had some feedback that I would send. It got too long for an email, so I have turned it into this. What I want to touch-on is the User eXperience of the Desktop client. I have my mac-mini hooked up to my Plasma and use the Plex Desktop client on it. I have subsequently installed a Apple TV elsewhere. The Apple TV is NICE. You can hack the Apple TV and put a Plex client on it! A REALLY good one. After doing this, I began using the Apple TV Plex client more often, because it was easier, ready-to-go, and its UX is pretty good. Below, I review the desktop client UX while keeping in mind the Apple TV client and other skins that are available for the desktop UI. I think that many many people stay with Plex and suggest it to others, because of the great job Plex has done on architecting the foundation, and the great job it does identifying and interacting with a variety of media and associated meta-data. Keep making meta-data acquisition and mgmt easier and more automated, in addition-to making it more manageable at the client sides. You notice errors in meta-data when you are using the system, not admining it. In the end – No one wants to deal with meta data mgmt – everyone wants it pristine. It can be done in many ways. You create your own organization to a degree. This is good and bad. Good for the AV geeks that Plex has been traditionally popular with – complex for the users that just want it to work ‘out of the box’. Simplification of plug-ins to channels was a great idea – much easier for understanding. Keep going with it. Bring the separate types of plug-ins all into one eventually. I think maybe this is done on the atv2 or iPhone?? not sure. The “Simplex Energized” skin does a good job of putting all the different channel types into one main menu item (see below). 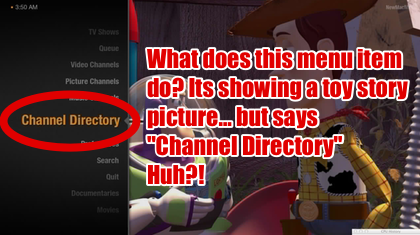 Even then, most people will mostly use only one or two kinds of these ‘Channels’. I use Video 98% of the time. Single best idea and implementation in the last year. It is not a UX piece of the desktop client so much, but I wanted mention it. myPlex is so nice for stupid-easy configuration, and for queuing videos I don’t want to watch at work or that I get via email. Its very needed and used by the oncoming onslaught of virgin users that Plex likely wants to encourage. The HD background for content, like once I am inside “Roger Rabbit”, or “Stargate Atlantis”. Those work AMAZINGLY well, and that experience has improved a lot. Keep it as is. However, see “Changing backgrounds” below. I love the large amount of preferences. Keep ’em coming. If nested smartly and UNIFORMLY, even new users can treat them right. The navigation of said preferences needs improvement – up, down, left, right, sub menus, sub sub menus, etc. Seems like there is inconsistency in which buttons are used to do what during the prefs navigation. See ‘Preference Navigation Confusion’ below. Love how they seem to be pretty wide open as to what they can implement and change. However, skins are not easily browsable and changeable out of the box. See ‘Skin Confusion’ below. The Plex desktop client is nice because it plays nice (very nice) with pirated content as well as your own burned and personal content. One initial confusion of the UI for me, is how to use and change the different viewing modes. Cool feature, that often gets in the way and provides initial confusion. Sometimes, when you click the right arrow enough, a right hand side pop-up comes up and lets you choose from different viewing styles. This right click or arrow is constantly hit by myself because I think that it will play the media or go into the menu. All of a sudden, some other pop-up menu appears. I do not know what it does by the text in it. Confused. I fumble around and see huge changes in the way that the media is shown. I eventually get back to browsing my content. Make it harder to find / enable. Fresh users should never run into it so easily. 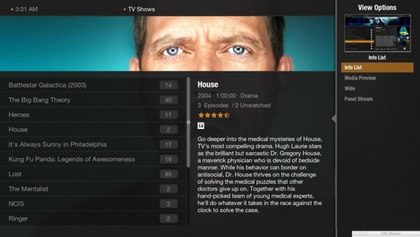 When you hover over a root menu item such as “movies” or “tv shows”, it shows to the right, a listing of the recently added, or recently watched – and their cover art. Bad choice I think. It is confusing to new users who expect to initially see, for example, their listing of 5 separate TV series that they have. Instead, it often shows me the same album cover art of 3 NCIS shows, and 2 album covers of the same art of The Mentalist. Both shows that are my wifes, that I don’t care about, and leaving me initially confused as to where my other 10 tv series might be navigable at. It is an excellent feature for seasoned users, who are part way into seasons and just want to get the next episode. It is not a good default feature to have on. Its not much of a leap to learn that you hit enter and go into that section, but it is an initial confusion that should be an option at the least. 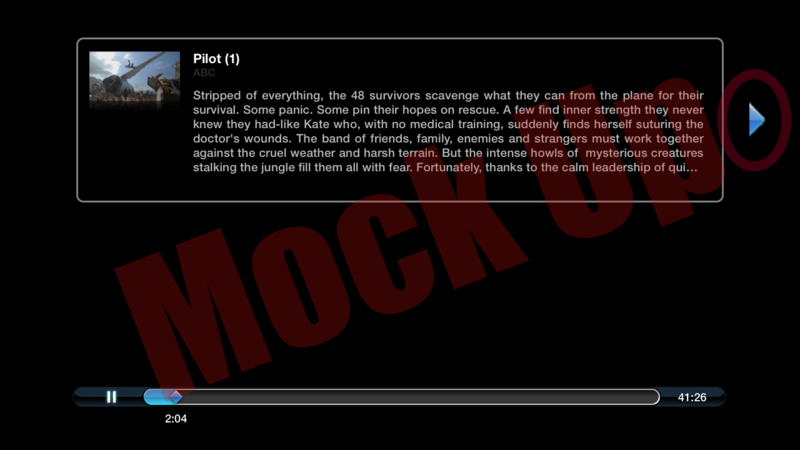 Many users will think that click right here and browsing these ondeck previews, is the only way to browse their media. I have zero need to define, each and every time that I come into a section, that I want to see “All items”. This is my #1 pet peeve – but I think that new users do not get confused by this – so its not too high on the UX food chain. I would venture to bet that the vast majority of users pick the “All…” option 90% of the time – or that they stick to one of the filters, most of the time. Axe ’em by default. My opinion would be to keep the filtering options, but not have it on by default / initial install. Give the preference option to set this or to turn it back on, for those users who like it. Its a nice idea, the use of HD art from your titles and music as backgrounds during the root menu items – but its confusing to new users. Keyword here is, ROOT menu. First menu I see as a new user. I liked it more before, when it was some really nice, but easy to associate HD pictures like the movie theatre, the old tv, and Elans dog (nice photography he and his wife do btw ). I know there are options for this in the prefs – but by default, KISS. Keep It Simple. Let advanced users hack away at their root menu backgrounds. On the desktop client, I did not see any easy way to select, before watching, which subtitle is available (to find out if there is any subtitles available at all, or if 5 are available), which ones is chosen, and if subtitles are on or off. There is an in-play option for much of this, but I think it makes the in-play experience cleaner if its accessible outside in the menus. 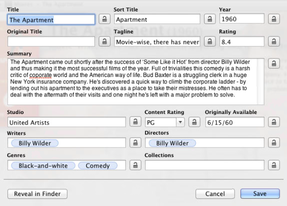 Attaining and managing subtitle meta-data for media needs major work and architecture expansion. In my experience, it can work (sometimes), and its there, but you don’t get much feedback, there is not much interaction if things go wrong. Management of subtitles should be available IN the client. There is so much room for error on subtitle-matching, that it is inevitable that user interaction (while browsing the media) will be needed. I like that subtitle offset is available in-play. This way you can match up subtitles that are off. However, the offset that you set does not seem to save when you play the episode again later, or on another client. Wish subtitle offset was saved somewhere. There should be no buttons to select. Do not allow the user to navigate left, right to buttons while media is playing. Its unintuitive. DVD players and VCRs never did this. I do however like the extended in-play menus on the right. They are handy when you need them. If they stay out of the way of beginner users (arent easily accessible), then they should stay. See next item for suggestions. You can still introduce complexity (menus for a/v options like subtitle details, and screen brightness) via something like the double up key and then right arrow. See below mock-up. Keep any detailed menus away from the default / beginner user, so that they are not confused and to them it “just works”. I spent 15 mins in the plex desktop interface trying to figure out how to browse, download and enable a new skin. I thought I recalled doing this in the past. I failed. I wanted to try another skin only because of the pet peaves and annoyances listed here. I was hoping that maybe skins also allow slightly different UX operations…. Someone at work a year ago told me to get Alaska. I am seeing now after some research that you have to d/l and place these manually or with preen. This eventually should be productized and available skins selectable in the options. If given the ability to enact 60% of the Media Manager content-org features, IN the client – Id pay for it after having seen it in action. Plex could upsell this. It would have to be done right and not rear its head for begining users or other family users. I know that this would be a complete rehaul in architecture, and everyone would start expecting the features on all clients. It would require a lot of resources, but damn it’d be friggin sweet to select an alternate background while browsing to my favorite series, or to correct a match while in bed with my apple tv 2 remote. It would be boss if, when you fix meta-data issues, that they are fed back to a writeable DB or API. I think I read that freebase is open writeable. Public DBs should learn from mistakes that users find and fix in the Media Manager or even in the client. I know you can’t fix this stuff in the client now, but I sure have found myself wanting to – and wishing that the change would have the possibility to be fixed for everyone. I especially like ATV2s options-layout once you are on a specific content title. I do not see anything like this in the desktop Plex. It gives 3 or 4 big buttons for “Play”, “Audio/Subs” (which a/v streams to play, which sub titles to play), and “More” (watched, unwatched… this section could handle so much more). I like the very limited options at first, that then branch out as I dive into those various buttons. I would cream my pants if the “More…” button was worked to have a “changed media meta-data” option where you then could fix its background art, matching, soft-delete it, etc. 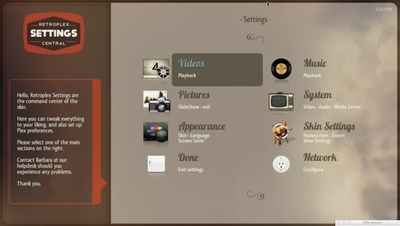 An initial submenu is off of the main root menu on the left hand side. All good. If you go into one of these – say “Videos”, there is now some other menu on the RIGHT side, and im not even sure where I am in the hierarchy. Did I go into the Videos section? I dont know, because the first submenu disappeared. Escape brings you out of the entire preference experience. Not even the root pref menu choice is displayed. I would have thought it would take you back one level. The rest of the UX acts in this former way. There is an awkward “Change Preferences For…” title at the top, and the title under it (the section you are in) can be changed. Only allow this context change back at the root level, not in two places. Confused me. I never know where I am located – there is no clear, visual “breadcrumb” of where I am in the hierarchy of menus. Needs to be simple and consistent like ATV2 menus are. No more “buttons”. Currently, you can hit left and right to focus on various “buttons” (up, down arrows for multibox selection). None of that. It confuses people I think. Instead, all menu items should act like this: you hit enter / play on them to change their value. THEN maybe you can do up and down. Other skins do the pref menu well. But because MediaStream is the default and other skins are not easily available, its confusing out of the box to noobs. Retroplex has done the grouping and visual appeal of the root pref pane nicely. Icons representing each category. Uses screen real estate nicely. Gives textual examples of what is within each category. Maybe some of the above cons are user-error (me), or I have not spent enough time with using the system . Either way, difficulty was met on the above points, and ‘program-error’ VS ‘user-error’ doesn’t exist in UX design. 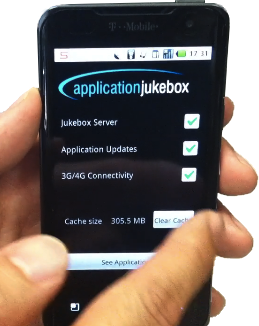 Virtualization of applications is becoming more reasonable. For example, they showed a smartphone being allowed to run as a server (yes, not normally done, but displays the low server requirements) that serves out the entire Photoshop app to a laptop. The laptop loads photoshop, albeit slowly at first, from the smartphone in under 20MB of streamed application byte-code content. I think that the streamed data then runs in a special virtualization agent (client) on the platform where you are wanting to run the application. Is this amazing? I dont quite grasp how it could revolutionize anything. If anything, its another tool for enterprise to reduce costs via cloud use-cases. Pairs programming – is development best done with someone assisting you over your back 100% of the time? Are open floor plans in offices beneficial, or does private space allow privacy and therefore creativity? I like the conclusion of this authors reasoning: It depends. 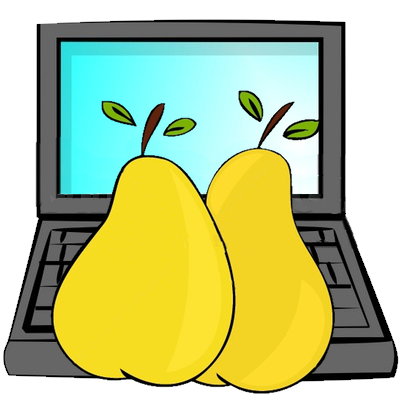 Pair programming research has shown it to be very useful IN THE RIGHT SITUATIUONS, but not all. Use it where it makes sense, and pair different kinds of people to get a diversity of view points. I recently have been messing around with my media setup (now that I have spare time – open source job leads anyone?). I wanted to get a couple of important sciency-type shows off of my Verizon FIOS DVR that have been trapped on it for years. So I sucessfully used a formula from a site that was formerly located at http://itsjustyouand.me/ . It worked! But the site was taken down. I have two needs: one, to record an episode of a certain TV show next week in high quality that is well-suited to burning to a DVD, and two, to keep my mind occupied to avoid dwelling on my current personal problems. In pursuit of satisfying those needs, I started reading up on how easy it would be to just pull the video from my DVR, which is a Motorola QIP6416-2 from Verizon FiOS. It has a ton of USB and FireWire ports, so I thought it wouldn’t be very difficult. Unfortunately, as is often the case, the internet is full of bogus blog entries, misinformation, forum threads that are hundreds of pages long and impossible to parse in a single sitting, and the few bits of relevant info you may find hasn’t been updated in years. I was finally able to get rid of the cruft and put together a simple process for recording HD video over FireWire that’s straightforward and doesn’t require any extra hardware or software. A compatible STB. Listing compatible STBs here is beyond the scope of this entry. If in doubt, go up to step 3 and make sure your STB shows up in the list. A 6-circuit FireWire cable. Hint: it’s the bigger kind of FireWire cable. Something running OS X. From what I’ve read, anything newer than 10.2 will do. I did this on 10.5.7. Connect the firewire cable from one of the ports on the back of the STB to your computer. Just to double check, go to the Apple Menu, then About this Mac, then More Info, then look under Hardware -> FireWire, and make sure your STB is in the list. Open AVCBrowser. It’s part of the FireWire SDK, and is easily found via Spotlight. Click Motorola QIP-6416-2 in the AVC Browser window. Click Open Device Control Panel. Click the Panel tab, then click Show Viewer, which will open VLC. Use your STB remote to either select a channel, or browse and play your DVR contents. Make note of the udp address in the title bar of the VLC stream that opens. In VLC, go to File -> Open Network. Type the udp address you noted earlier into the Media Resource Locator field. This whole process might not be the best way to do this. I’m not sure. Either way, this works. Check the Streaming/Saving box, then click Settings. Check “Display stream locally” and select a destination with the “Browse” button next to File. Note: pick a drive that has quite a bit of storage space available. I’ve read that this video can take up around 9 gigs per hour. You can transcode here if you wish. I didn’t bother. Click OK, then OK again. It should reopen the stream from your STB and begin recording. That should do it. You can change the video file name from the default “vlc-output.ts” if you like. Use the .mpg file extension. As far as I can tell, this technique will record the video at whatever resolution the channel is broadcasting in, so some will be 720p and some will be 1080i. And yes, it works with the movie channels. I didn’t try it with any On Demand content. I’d also like to mention that I tried a few other oft-recommended apps, namely VirtualDVHS and FireRecord, and neither worked worth a damn. VirtualDVHS picked up the STB fine, but I couldn’t get it to actually record anything. FireRecord 0.5h picked up the STB and pretended to record, and I liked the scheduling aspects quite a bit, but the video format was either corrupt or I screwed up while recording. I couldn’t get it to play in VLC or Quicktime, even after renaming to .mpg. I also couldn’t get MPEG Streamclip to open it for conversion. I just assume I screwed up somehow while recording. I hope someone finds this useful. I read in a lot of places that it wasn’t possible to pull video from these things. It seems to be true that you can’t just download a file from the STB’s hard drive, but this method is almost as good. While I appreciate the good news and your amazing efforts, is there something that a Windows PC can do the same thing as your Apple? I recorded four movies that are laying dormant on the hard drive and I want to extract them onto my PC for burning to a DVD using Nero. Unfortunately, I was told by Verizon there are no output jacks from this Motorola unit that would allow me to do this. Other than the five jacks (three color and two audio) that plug into the TV, I do not even know how to reconfigure them to plug into my DVD recorder that only has one video jack and two audios. I’m no expert on this sort of thing, but I’m pretty sure that the only way to get any output from this STB is over Firewire, not through the composite/component/HDMI interfaces. I know there are quite a few equivalent PC apps that will accomplish this, but I don’t use them, so I can’t give you specifics. You should be able to find them with some searching. Thanks for these instructions. I haven’t got to actually work yet, but I’m closer than I’ve been! I can get VLC to display what is playing on the STB, but I haven’t been able to get it to record. I’m using a G4 powerbook, OS X 10.4.11, and VLC 0.8.6i. If it’s a leopard or PPC vs Intel issue, I can first try my wife’s intel macbook, and then upgrade to leopard if that doesn’t work. OK, was able to record after updating to after updating VLC to 0.9.10. 30 seconds of HD = 102 megs. But my results are are not easily repeatable. I tried recording something from a non-HD program, and couldn’t get it to work again. So basically, I know it’s possible, but it certainly seems a PITA. Thanks again for your help in getting me this far! Thanks for posting this info online. I read on the Motorola site that the QIP6416-2 needs a software upgrade in order to allow the transfer of it’s recorded data to an external hard drive. Yet, you seem to have come up with a method for capturing live media. I noticed the title of your article includes previously recorded TV. I have several programs I have recorded and now have very limited space to record any other movies. Is there a difference in the detailed instructions you provided on capturing live media and transferring recorded media to a Mac or external drive? I can only tell you that it seems to be a little finicky. Sometimes, following these steps, I can get it to work the first try. Others it takes a few reboots of the computer and the STB to get things working. It’s pretty frustrating, but better than nothing. Ok, thanks. I’ll have to give it a try. After trying several times, using my standard and admin accounts, I cannot get this method to work. Restarting my Mac, swapping firewire ports, turning the DVR on & off, and again it does not seem to work. If this is finicky I would hate to see down right stubborn (LOL). However, everything works up to step nine, but clearly that is the most crucial step. 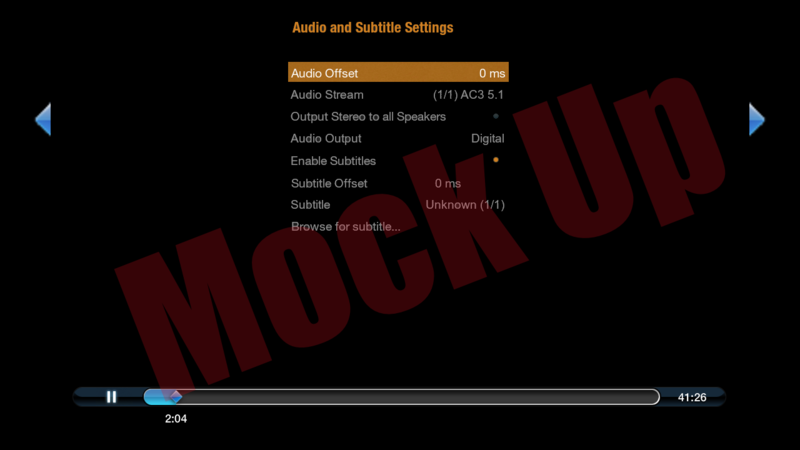 Maybe there are VLC preferences, you did not mention, that need to be configured. Perhaps, there are certain network ports I do not have enabled. I gave it a fair try. Thanks. I can’t say. It’s been 4 months since I did this, so maybe there have been firmware changes to the STB or something. I haven’t tried it since I posted this. I finally got some sample video to work from live TV. I have yet to try recorded video, which is what I really want. However, I paid a price to get these results. One, I stayed up all night working on this; and two, I purchased the QuickTime MPEG-2 Playback Component. Also, I used a different method to get it to work, but it works flawlessly. No restarting my Mac or DVR required. Dollar wise it cost me $21.74 (including tax) and I think it is worth it. Hopefully, I can get the same results working on the recorded shows. I will post my results once I get to it. By the way, besides using the QuickTime MPEG-2 Playback Component, I used the AVCVideoCap application (it is also part of the free Apple Firewire SDK) and MPEG Streamclip (freeware). The initial instructions that got me started can be found at the link below. Well, I can only capture recorded video from the local programming channels. All basic and premium cable channels are limited to one copy (the copy already on my DVR). In the MPEG Streamclip application GUI the EMI field gives an indication if video can be copied more than once. For example, if it lists “Copy Once” it means the copy already on my DVR is the only copy I can view, and if it lists “Copy Freely” it means the video can be copied and viewed multiple times. Again, thanks for listing this info on your blog and I hope this additional info helps you and others that find your blog. I have followed your guide and everything is working but the actual recording. The output file is created and is zero kilobytes. Am i possibly doing something wrong? I get the display on my macbook/10.6.2. I have a pace dvr and I can record with AVCVideoCap and FireRecord, but sometimes the video is not viewable in any other viewer/program other than VLC on playback. I have to encode with HandBrake before MPEG Streamclip shows the video so I can edit the commercials out. If anyone has any information for me in regards to getting VLC to actually record for myself. Like I said, I can get it working with other programs, I just have a feeling that recording with VLC may give me better options for when I want to edit the video. Thanks for the hint. All steps seem to work except at step 15 VLC is not capturing even though it appears to be in ‘Play’ mode. Also, AVCVideoCap reports “Other/Unknown” Stream format. Cannot thank you enough! I am pretty new to Mac and have been pulling my hair out trying to capture video from TV, I knew there had to be a way without buying expensive software. Pulled some more out after buying Firewire 9 pin to 6 pin cable today at Best Buy, thinking all I had to do was hook the cables up, no luck…all packed up and ready to take return – until I read your step by steps… It works! THANK YOU very much! When trying to sell something that someone doesn’t know they need, explain to them specifically some functionality that they will gain. It has to be a functionality that is useful, different, and that most of the audience will get excited about. Don’t only explain what the product is or does – example a use-case or scenario where it would be useful, in addition to explaining in detail what the doodad is. Yes its free, yes its available, but why do I need it? The current version suites me quite well and works quite well. Maybe it added a cool new feature that allows you to variably set how long popups stay showing, dependent on the content in the popup. You could use this to tell popups containing your “name” to stay up for forever, and all other popups to disappear after 5 seconds. I would then rush to download the new version.